Various Artists "A Tribute to Bad Lyrics"
The simple premise - cartoonist, designer, and illustrator Pat Moriarity found what he felt were some of the worst song lyrics he could find (mostly song poems and really old recordings) and talked his friends into doing a straight faced, heartfelt rendition of each one. The project was mastered by the legendary Jack Endino of Sub Pop, Nirviana and Pacific Northwest fame. Moriarity not only brainstormed this low budget project, he personally signed and numbered all 500 of them! 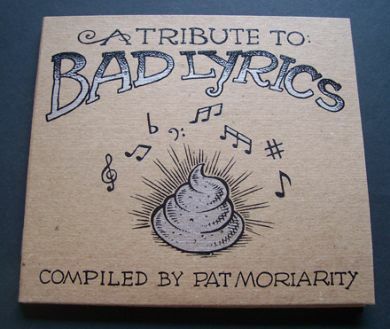 "Tribute To Bad Lyrics" features brand new recordings by the legendary BUZZY LINHART, Seattle's BOSS MARTIANS, DANIEL DAVIES (Singer for YEAR LONG DISASTER and son of Kinks Dave Davies), CHARLIE BURTON and others for a total of 21 tracks. Musician ANDREW CROWLEY (Fat Tuesday, Ear Illusion Music) not only contributed a track, but composed and played the music of the spoken word pieces, including a track spoken by DAVID GREENBERGER of DUPLEX PLANET!! "This was a real D.I.Y. project. I self-published it, I drew and lettered everything, the booklets were handmade by mini comix guru MICHAEL DOWERS (Brownfield Press), and the cardboard covers were screened by NW rock poster maker GABRIEL LEE (Gryphon Graphics). The covers are black and silver on recycled cardboard" states Moriarity about his creation. The original recordings these songs were based on are NOT included in this disc. The originals can be found and downloaded for free, available on the WFMU website. Just search the blog at http://blog.wfmu.org/freeform/mp3s/.